The Mindo Cloud Forest is located in western slopes of the Andes in the area where two of the most biologically diverse ecoregions meet...Chocoan Lowlands and Tropical Andes. Due to the lower altitude and coastal influence, the weather is warmer which also helps generate a humid and subtropical Cloud Forest. This unique combination allows for a variety of flora and fauna to flourish and make Mindo a must visit town in Ecuador. 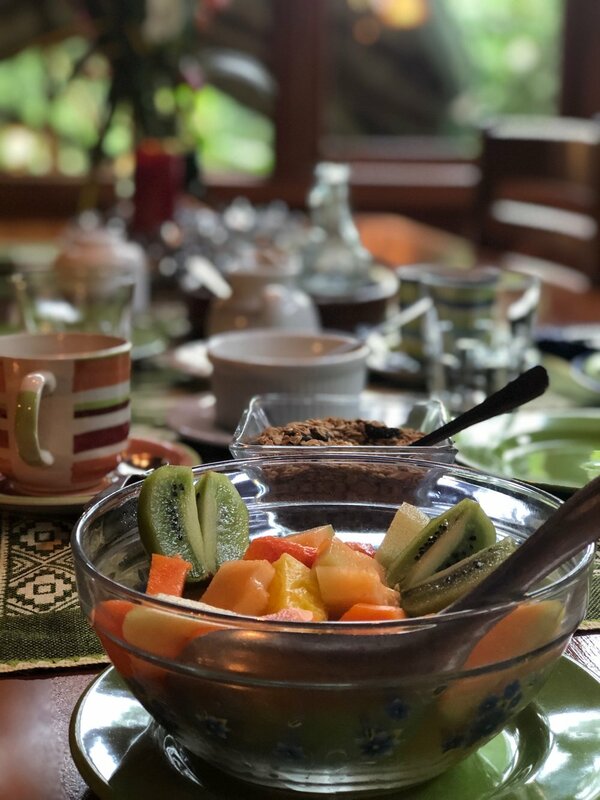 One of the experiences we were looking for in Mindo was to find an accomodation which offered us the opportunity to sleep in the middle of the Cloud Forest. 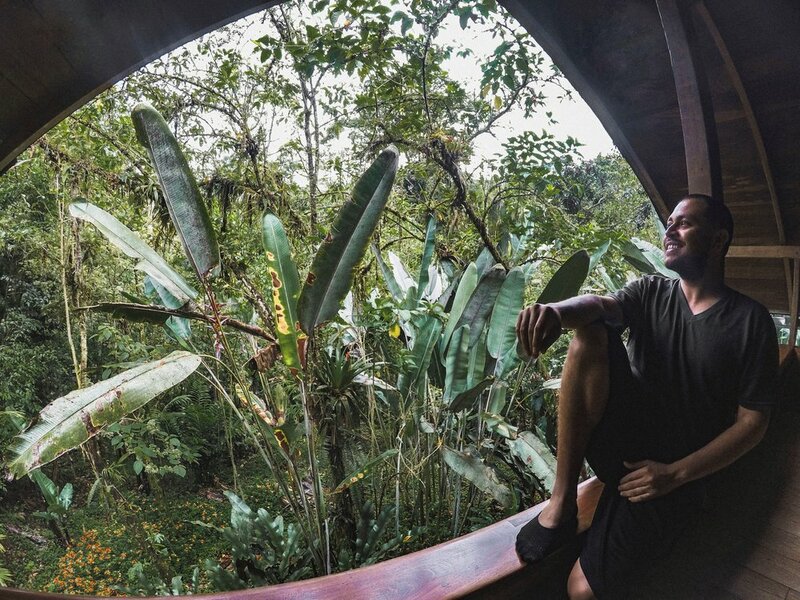 While researching, we found the eco-friendly Casa Divina Lodge. Casa Divina is located only 1.2 km away from the city center and easily accessible. We took a $2 taxi from the center of Mindo towards Casa Divina and arrived fairly quickly. This place was simply stunning! As soon as you start walking up the path towards Casa Divina the adventure starts. The small path gives you a nice introduction on what to expect when you reach the main entrance. We followed the curving path and arrived to the doorsteps...we had reached Casa Divina. We could not stop looking around at this incredible and stunning spot in the middle of the Cloud Forest. At that moment, we looked at each other and knew this was going to be a good time! As we arrived, we walked inside La Casa Grande to check in. The process was seamless and off we went towards our cabin. On our walk from the main cabin, we were impressed with how well Casa Divina preserved the Cloud Forest while building the hand made cabins. We arrived to our cabin on the 2nd floor with a beautiful terrace. I pulled the key out of my right pocket and was ready to enter heaven in Mindo’s Cloud Forest. Wow...this was honestly our first thought when we looked at the beauty and size of this place. It was perfect! We had a comfortable bed, an incredible view with hammocks on the terrace, huge space for both of us and a charming bathroom. The cabin made us feel welcomed and comfortable. I can honestly say the best part was going to sleep and waking up to the wild noises of the Cloud Forest. The room is very well ventilated as it has screens at the top and the air flows from one side of the cabin to the other. These screens allow for you to clearly listen to the wonderful sounds of the Cloud Forest. They sounded specially magical at night and early in the morning. We had no problem sleeping warm at night since we had about three warm blankets. The shower was equipped with strong water pressure and plenty of hot water. One of the best showers we’ve had. One of our favorite things to do in Casa Divina was birdwatch. In the morning, they provide a delicious and very filling breakfast. The best part of this breakfast is the opportunity to birdwatch as we sat down and enjoyed our coffee and juice. There is a very cool set up in which they put plantains on a bird feeder and the birds just flock in. The bird feeder is located directly in front of the breakfast table. It was such an experience to see all the colorful birds come down to eat and literally be so close and catch a glimpse. A bird guide is provided next to the window so you can figure out what kind of birds you are looking at. We must say, we learned a lot about birds during our stay. Our second home became the open terrace on the top floor. This spot is good to sit back, relax and enjoy. After our breakfast we headed up there. We had the opportunity to enjoy our coffee, get some work done and of course birdwatch. We spent several hours up there and didn’t even feel the day go by. We were very lucky to spot some amazing birds. We were able to spot the beautiful and colorful Quetzal! This had to be the highlight of our birdwatching experience. We also had the chance to spot some Toucans up close! We were able to see two different species on two different occasions. It was the coolest thing ever! Casa Divina was incredible and we had no need to leave. We enjoyed the time up in the terrace and the setting felt like our living room back home. It made us want to chill and take in the views of the Cloud Forest. One of the big initiatives Casa Divina has is their sustainability program. A priority for them is to maintain the beauty of the Mindo Cloud Forest. In order to achieve this goal, they have taken part of the Socio Bosque Program that is funded by the Ministry of the Environment of Ecuador (MAE). MAE offers economic incentives to owners of land with native forest to guarantee its protection over the long term. The main goals of the program is to conserve native forests, significantly reduce deforestation and improve the well-being of farmers, indigenous communities and other groups living in the rural areas of Ecuador. Casa Divina is very conscious of the waste that is produced when operating a business. Recycling and separation of waste has been a practice for many years. Along with this, they only use biodegradable cleaning products and natural repellent to ensure there is no contamination to the forest. They purchase products that help minimize environmental impact as much as possible. Casa Divina is always looking for local and organic providers. They are also conservative with the amount of electricity they use and have implemented energy efficient machines and LED lighting. When you walk around the property, you will notice all these practices in place. The design of the cabins are really nice, but what makes it extra special is knowing that Casa Divina was handcrafted from sustainably harvested timber on the surrounding land. It also used all natural construction materials when the cabins were being built. Another one of our favorites were the plastic recycled containers in the all the rooms. These containers were created by ladies of ecobicy and Chachi Tejidos, a group of women of the Chachi-Capaya tribe that have taken recycled plastic to make this useful container. Now the same plastic that was once collected, is being used in a stylish way to keep collecting recycles for future containers. Our favorite of them all, was definitely the hand soap, shampoo, conditioner and body wash in the bathroom. How cool to actually be able to use this product during our stay knowing that it is environmentally friendly and let me tell you…it was the best shampoo, conditioner and body wash we have ever used! As we travel around the world, one of our main priorities is to always buy local and help the local economy. Being able to stay at a place that has similar practices, beliefs and values as us felt soooo good! We had the opportunity to go into town with Camila from Casa Dvina and saw how she went to the local grocery store to buy things to take back. Casa Divina also stays true to their commitment of working with the local community to help in every aspect as possible. They operate Sabina Tours in which they offer tours around Mindo. They work with local professional bilingual guides that have wide knowledge of the fauna and flora in the area. If this was not enough, they have great relationships with the farmers, fishermen and ranchers around Mindo. All dairy and meat served at the property is local. Something that caught our eye was the entrepreneur wall. This wall showcases various products which are created and supplied by Mindo entrepreneurs. These products include: coffee, chocolate, hand painted coffee mugs and paintings amongst other things. Casa Divina is located close to the center of Mindo and easy to access. One of the things we noticed when doing any tours from Mindo was that most of them passed by or went towards the property. This made it very convenient for us to plan a tour or do a couple of things on our own. You will even find two self-guided senderos (paths) on the property that you can easily do in the morning after breakfast or when you have some free time. They are not hard at all and will give you some beautiful views from the surroundings. Our stay at Casa Divina, what just that… divina. We truly enjoyed all the different aspects they have to offer. What we loved most was not only their sustainability efforts, but the fact that they go above and beyond to teach you as a visitor how to become a sustainable traveler. What really impressed us was their “Passenger Code of Conduct”. This is located in a booklet available in all rooms which highlights some traditions and local customs of Ecuador, tells you how you can directly impact the local economy and how to respect the local environment. They also show you how to be an informed and respectful traveler as well as have patrimonial care when visiting wild, heritage or archeological sites. We personally feel that the initiatives at Casa Divina speak volumes of the people who own and operate this business day in and day out. To take the time to educate us as a traveler of our impact we have on the world and what things we can do to be more conscious about our earth is simply amazing. We can’t say enough about our experience at Casa Divina. It was educational, comfortable, relaxing and one of a kind. If you are ever around Ecuador, make sure to make a stop in Mindo. Once you are in Mindo, you know where to go… Casa Divina! They will welcome you with open arms and make you feel at home in their slice of paradise. *No, there was no money involved. This post was part of a collaboration with Casa Divina Lodge. All the opinions and reviews are completely our own.